When I was growing up taking group lessons at a hunter/jumper barn in central Virginia, I occasionally witnessed other students fall off horses. It didn’t happen often, considering how many children took lessons there each week, but it did happen. My instructor, who was a British Horse Society veteran, would assess the student before letting her stand up, and once she’d established the student wasn’t seriously hurt or terrified, she’d ask how many times they’d fallen. Interestingly, the number of falls it took to make a rider always seemed to change based on the student’s experience. She understood intuitively that most kids in that setting were more embarrassed to be stared at by the rest of the class as they wiped dirt off their palms than they were frightened. It was her way of reminding us that falling off comes with the territory for riders of all ages and experience levels. It’s just part of the journey. As an adult, I’m perhaps more aware of that reality than I was as a daredevil kid, seizing every opportunity for a wild canter through the fields and jumping everything I could find. Now I know the question isn’t whether you’ll fall or even how many times, but how unlucky you’ll be with regards to the injuries you get on impact. Most of the time, I swing a leg over Jitterbug with very little conscious thought about this… but that doesn’t mean it isn’t in my mind somewhere. The mind is a tricky thing. It hangs onto some experiences, and lets go of others; it learns what it wants, when it wants, and it sometimes (for me at least) feels like its conclusions are the result of a board meeting I didn’t get invited to. I’ve written a lot about my anxieties related to jumping. Until this spring, I thought most of my issue was a combination of overthinking and a fear of height. I was so proud last summer when I finally found myself comfortable at the beginner novice division. Jumps no longer grew six inches with every approaching stride, and I felt really good. It wasn’t until I found myself struggling at the start of this year that I realized my issues might run more deeply. When I was still a teenager, I had a scary fall. I was schooling a horse outside a lesson for one of the first times ever and pointed her at a fence we hadn’t tried before. I didn’t notice there was no ground line on the side we were approaching from, and the mare badly misjudged the fence’s location. She took off a stride and a half away, landed on top of the jump, and fell, throwing me thankfully clear. I didn’t know until afterwards what my error had been, but there was a very specific moment in midair where I was jumped out of the tack, legs loose and disconnected, when I realized that something was terribly wrong. Neither of us was seriously hurt, but it rattled me deeply because I knew we could have been, and it was all thanks to one blink-of-an-eye, greenie error on my part. Although I’ve jumped many times since then largely without incident, I’ve always been unsettled by awkward jumps that throw my upper body when the spot is too short and the arc of the movement too upright. It wasn’t until I did some soul-searching this year that I realized the feeling of being thrown back triggered a memory for me of that moment hanging in the air years ago, trying to figure out what was wrong and whether I could stick with the horse on the landing. My palms would sweat; my shoulders would tighten, and I finally realized it was because I was re-experiencing the accident, in tiny ways, over and over. Awkward spots like this would make me inexplicably nervous. It feels absurd to worry about this still. How many riders have experienced traumatic, dramatic, permanently-scarring falls and gone right back to schooling young prospects and climbing Rolex fences? I didn’t end up in the hospital, or lose my horse. How do people move forward from bigger traumas like that? I decided I’d ask one of them. Ashker has always been open about everything, as her social media followers are well aware. Her emotional recovery after her accidents, including her 2008 rotational fall at the Rolex Kentucky CCI**** that resulted in the death of her mount, Frodo Baggins, was no exception. 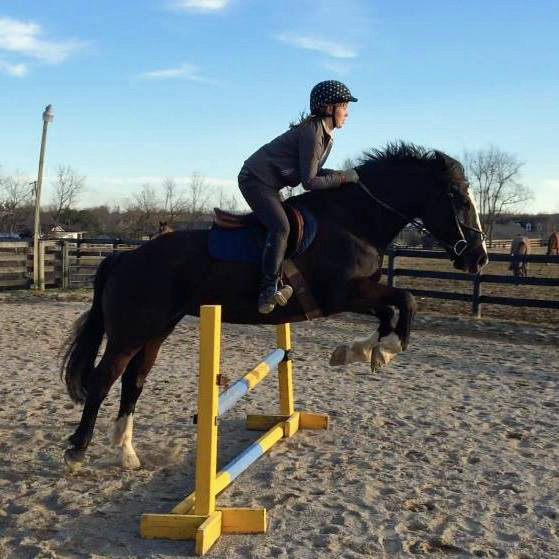 Ashker fields questions about confidence from ammy riders like me all the time on Instagram and Facebook and said that process of being a sounding board for others has helped in her emotional recovery. Ashker told me that for her, there’s some truth to the old saying about getting back on the horse. 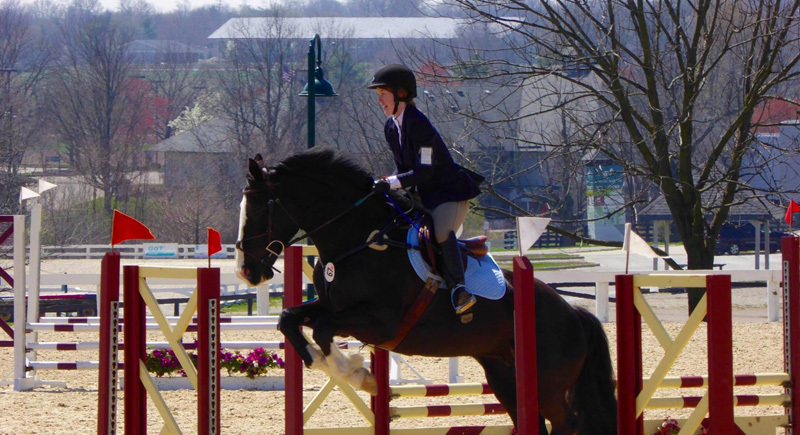 If a rider isn’t hurt too badly, she thinks the best thing they can do is climb back aboard and at least work through the problem that preceded the fall, even if they can’t take the same jump over again. When that’s not possible, she suggests using the time off to visualize the positive, not the fall. When you come back from a scare, she suggested, treat yourself the way you’d treat a horse: don’t rush it. No one ever criticizes a rider for giving themselves or their horse extra time and experience for a move-up, and there’s a good reason for that. One of the most helpful things she suggested was harnessing the power of an overactive brain (like mine) to help problem-solve. Once you figure out what caused a fall (spoiler alert: you probably had something to do with it), you can create a checklist of ways to avoid making the same mistake. Instead of panicking and drawing a blank on the way to the next fence or gallop set, run through your list. Is it always possible to come back from a confidence shake? “I think everybody can,” Ashker said. “I think if you’ve had it once, you can gain it back. It’s like with horses. I think there’s no such thing as a ‘ruined horse;’ there’s just a different way to approach and sort that horse out.